Anchal eats porridge every single day. Jumbo oats, milk, cinnamon, cranberries, flaxseeds and coconut. Tara eats plain yoghurt and granola almost every day. Except for this Sunday. This Sunday we’re going to wing it a bit and try to get ready for what we call “pre-Whole 30” – a lower carb week to prepare for our month of no dairy (tears), no carbs (headaches) and no sugar (mood swings). God help anyone around us! But hopefully it’ll help us understand if we have any intolerances and also to draw a line under the Summer of Sugar (with Chips on the Side). For example, we’re suspecting that our sinus problems are all due to our dairy consumption – so it’ll be interesting to see if we feel any better without it. 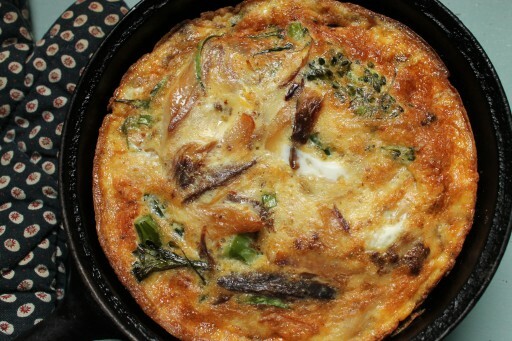 So this Sunday we’re waking up to protein heaven – a frittata made with eggs, smoked mackerel and broccoli. And because we’re Indian, we couldn’t help adding a bit of garam masala! We’ve adapted a brilliant Waitrose Kitchen recipe and it’s totally yummy. A perfect choice for Sunday brunch! Steam the broccoli – we set a large sieve over boiling water and cover it with a pan lid. Steam for about 10 minutes until full cooked but not soggy. Set aside to cool slightly. In a large mixing bowl, whisk the eggs together. Add the broccoli, mackerel, garam masala, chilli, salt, and tarragon. Stir to incorporate. 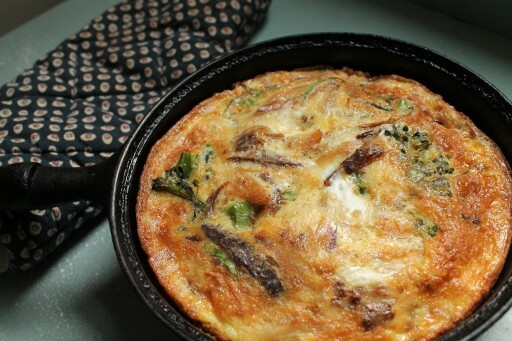 Melt the butter in a cast-iron pan and the pour in the egg mixture. Stir well and then leave to cook over medium-heat for 5 minutes. The bottom and sides could be cooked through. The middle should be beginning to set and it’s perfectly normal for it to wobble still at this stage. Put the pan under the grill and cook for a couple of minutes until puffed and golden. Serve immediately with hot sauce and buttered toast if you’re that way inclined! So what do you think? Feel free to share your questions and comments below! We’d love to hear what you have to say.